Most famous for their Non Vintage Rose, they craft wines of "finesse, balance, and elegance"
Champagne Billecart-Salmon is a small family owned house in Mareuil-sur-Aÿ best known for their lovely Non Vintage Rose - see below for a tasting note. They are one of the few Champagne Houses that are still family owned, and were formed in 1818 by the marriage of Nicolas François Billecart and Elisabeth Salmon. Today run by Francois and Antoine Roland-Billecart together with their father Jean, the house is known for, in their words, "finesse, balance, and elegance" - and I agree. They use a long and slow fermentation of their wines. Like most Champagne Houses, Billecart Salmon doesn't own enough vineyards to supply all their grape needs and hence contracts with farmers. Unlike most houses however, Billecart-Salmon sold off most of their vineyards due to financial reasons in the 1920s. If anything, this makes their quality even more impressive. They make a nearly dizzying array of wines, but their best wines are their Brut Rose (tasting note below), their Vintage Blanc de Blancs Brut, and their Vintage Rose Cuvee Elizabeth Salmon. Some would add their Cuvee Nicolas Francois Billecart to this list although I haven't experienced it enough to intelligently comment, other than to say I like it a lot. Tasting notes over the past few vintages are variable as well. Billecart-Salmon Brut Reserve - this wine makes the majority of their production, and has a high percentage of Pinot Meunier, making it fruity and somewhat sweet. It's usually a blend of three vintages, and not bad, but certainly not one of their best wines nor best values. Billecart-Salmon Brut Demi-Sec - the same wine as their Brut Reserve, but with a higher added dosage so it is a semi-sweet wine. Billecart-Salmon Brut Sous-Bois - this wine is entirely vinified in oak, meaning fermented and aged in oak, as Champagne was traditionally. A very toasty, creamy, and rich wine, which is a new additional to their Champagnes. Made of Pinot Noir, Pinot Meunier, and Chardonnay. As far as I can tell it is not available in the US nor did I find it in the UK recently. Billecart-Salmon Extra Brut Reserve - available in both vintage and non vintage varieties, this is a zero dosage hence very dry Champagne. It is fairly new and high in Pinot Meunier just like the Brut Reserve, with 40% Pinot Meunier, 35% Pinot Noir and 25% Chardonnay. Billecart-Salmon Blanc de Blancs - their non vintage Blanc de Blancs is a lovely wine, 100% Chardonnay as are all Blanc de Blancs, with grapes from the Grand Cru villages of Avize, Chouilly, Cramant, Oger, and Mesnil-sur-Oger. Billecart-Salmon Vintage Blanc de Blancs - this is a vintage wine, with grapes from the Grand Cru villages of Avize, Chouilly, and Mesnil-sur-Oger. Superb. 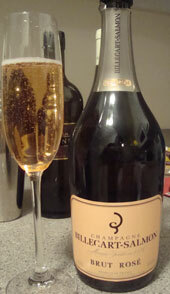 Billecart-Salmon Brut Rose - their iconoclastic wine, and a go to rose for me and many others. Their most famous wine, made of Pinot Noir, Chardonnay, and Pinot Meunier, with about 6% of still Pinot Noir added for color. Billecart-Salmon Cuvee Elizabeth Salmon Rose - they have made this stunning vintage rose since 1988, and it is a blend of 50% Pinot Noir and 50% Chardonnay vinifed as white wine, with an added quantity of still Pinot Noir from Mareuil-sur-Aÿ. It is a much darker and bigger tasting wine than their Brut Rose and ideal with dinner. My mouth is watering just writing about it. Billecart-Salmon Grand Cuvee - this might be considering their entry level vintage wine, made since 1982, aged for 10 years before release in their cellars, and 100% Grand Cru Pinot Noir and Chardonnay. Billecart-Salmon Cuvee Nicolas Francois Billecart - made since 1964 from Cote des Blancs Chardonnay and Montagne de Reims Pinot Noir partially vinified in oak barrels. A powerful Champagne high in Pinot Noir. Billecart-Salmon Cuvee Le Clos Sainte Hilaire - a new and 100% Pinot Noir wine (Blanc de Noirs) made from a one hectare walled vineyard in Mareuil-sur-Aÿ, and named after the patron saint of Mareuil-sur-Aÿ. They make between 3500 to 7500 bottles in great years only, and the vines were planted in 1964. 3-4 year old barrels previously used for Montrachet are employed, and there is no dosage. Expect to pay a few hundred US dollars a bottle if you can find it. I've never seen a bottle. The nose shows fresh bread dough, poached pears, a laid back minerality, and with air and warming, strawberries. On the palate a bit of smooth and high toned apple. Great mouth feel, smooth and mellow yet not at all wimpy. A wine of grace. White and light red fruits buoyed by perfectly balanced acidity and minerals on the finish. As mentioned before, their best known wine and for good reason. Fortunately this is widely available.